[L]anguage, gesture, and the imitative arts, become at once the representation and the medium, the pencil and the picture, the chisel and the statute, the chord and the harmony. The social sympathies, or those laws from which, as from its elements, society results, begin to develop themselves from the moment that two human beings coexist; the future is contained within the present, as the plant within the seed; and equality, diversity, unity, contrast, mutual dependence, become the principles alone capable of affording the motives according to which the will of a social being is determined to action, inasmuch as he is social… Hence men, even in the infancy of society, observe a certain order in their words and actions, distinct from that of the objects and the impressions represented by them, all expression being subject to the laws of that from which it proceeds. Like Shelley, Clark argues that poetry has a civic as well as an aesthetic significance. Unlike Shelley, Clark reduces poetry to its formal linguistic properties to make his case. The thesis of Stay on Message is that ‘the aesthetic and ethical qualities in public language are mutually influential’ and that ‘the aesthetics are critical factors in determining the ethics, and vice versa’. Most baldly, he claims that ‘when we discuss political speech, we are discussing a species of poetry’ and that ‘all public language is necessarily and inherently poetry’. It is our largely unconscious understanding of its poetic that feeds into our understandings of and responses to public speech; and his conclusion is that if we were better able to understand how poems work, we would be better citizens. Clark makes an interesting if, in my view, frustratingly partial case. He seeks to draw the critique of political language away from a strictly literary or written context, critiquing it as oral language, sensitive to its context and place. In doing so, he takes particular issue with the literary bias of George Orwell’s essay ‘Politics and the English Language’, in which Orwell attacks what he calls ‘prefabricated language’. Clark argues that prefab phrases or ‘language formulas’ are necessary in any improvised poetic art. Here he is drawing from Milman Parry, who revolutionised the understandings of traditional oral poetry with his landmark study on Homeric epithets – recurring phrases such as the ‘wine dark sea’ or the ‘blue eyebrows of Poseidon’ – and from Walter Ong’s extensive studies of oral cultures. Stock phrases, Clark says, occur in oral poetry for the same reasons they occur in political speeches: they are mnemonic devices; they are familiar signals that permit listeners to grasp what they are hearing; they help speakers to stay ‘on message’; they highlight important aspects of the speech that they want listeners to remember. In fact, clichés are a strength in oral language, and are an important aspect of its forcefulness. Aside from noting the formal parallels between poetry and public speech – such aspects as metre, metonymy and so on – Clark is guided by the notion that poetry enacts a phenomenological experience of ‘becoming’. He quotes Terry Eagleton: ‘It is as though poetry grants us the actual experience of seeing meaning take shape as a practice, rather than handling it simply as a finished object.’ Eagleton, arguing against sharp distinctions between content and form in poems, says that poetry is the art that makes us conscious of the medium of language. Clark wants to take that poetic consciousness of language itself, and apply it to everyday public speech. The meaning of poetry – and public speech – is, in other words, deeply embedded in the experience of it, a quality Clark calls the ‘texture’ of language. And he later relates this ‘texture’ to our judgments of its truthfulness. Clark is pointing out that, like all language, political speech has poetic qualities that can be exploited, for good or ill. This seems unarguable, even obvious. Clark uses powerful examples of oratory, such as Martin Luther King’s famous speech, ‘I have a dream’, or Barack Obama’s inauguration speech, to show how poetic devices can be used effectively. But claiming that all political speech is therefore poetry is a vastly bigger stretch, and I fear Clark does some damage to poetry on the way. Clark’s definitions of his major categories, ‘public language’ and ‘poetry’, seem especially vexed. For Clark, poetry encompasses anything said in public by anybody – from television interviews to political speeches to op-eds. He restricts himself to instances of language, and so refrains from Shelley’s exhilarating extension of poetry’s domain in ‘A Defence of Poetry’: for Shelley, poetry includes philosophy, science, drama, civic discourse, religion – in fact, all creative thought. ‘It is,’ says Shelley with true Romantic grandeur, ‘at once the centre and circumference of knowledge.’ The danger of such arguments in both cases is that it makes poetry so generalised a category that it is useless; but paradoxically, the very boldness of Shelleys’ claims seem to me more useful, both poetically and politically, than Clark’s circumscribed language acts. This is because Shelley considers poetry to be thought-in-action, whereas Clark discusses it as a phenomenon of more-or-less legible linguistic behaviour intended to manipulate others, enacted with successful or unsuccessful effect. Clark’s distinction between ‘private’ and ‘public’ utterance is also tenuous: ‘a public remark typically has the potential to influence more people than a private remark.’ He links ‘public’ in particular to professions and professional speech. But how true is this now, when ‘private’, non-professional people can address considerable publics? What does public language mean in the age of digital communication, when teenagers can gather audiences of millions on YouTube, when almost every politician has a twitter account, when the President of the United States takes questions on Reddit? Clark touches on the idea of ‘intimate publics’, and mentions Oprah along the way, but glosses this aspect of contemporary public language almost entirely. And this raises another major problem: while Clark continually argues for the orality of public language, he gives very little consideration to what performance might be. In considering the complexity of the contemporary nexus between ‘public’ and ‘private’, and how vexed these ideas now are, it seems to me that an understanding of performance is at least as important a tool for critiquing contemporary political speech as poetic prosodies. Despite his arguing against a literary criticism of public speech, Clark’s argument is almost entirely literary. A central idea – of language ‘becoming’ – is taken from Eagleton’s book How to Read a Poem. Here Eagleton draws a distinction between what he calls ‘everyday language’ and the language of poetry. Although Eagleton says that there is no clear break between literature and life, he makes an interesting point that Clark rather glosses. Eagleton says that poetry, more than most other literary arts, ‘puts on show what is true about our language anyway, but which goes unnoticed’: the fact that the content of language is a function of its form, rather than, as we generally assume, the other way around. ‘Ordinary language, like history for Nietzsche or the ego for Freud, operates by a kind of salutary amnesia or repression. Poetry is the kind of writing which stands this inversion of form and content, or signifier and signified, on its feet again. It makes it hard for us to brush aside the words to get to the meaning.’ (My emphasis). The major difficulty with Clark’s conflation of political speech and poetry is summed up in his title. Poems do not – in fact, cannot – ‘stay on message’. (Well, perhaps bad poems do: and it might be a measure of their badness). Contemporary political speech, to take it in its narrowest definition, is all about ‘getting to the meaning’. As Clark often reminds us, it is directly instrumental: it uses language in order to manipulate a public. He isn’t incorrect when he says that language is inherently manipulative; but in order to manipulate its public, successful poetry in fact does the opposite of successful political speech. Unlike an effective political message – ‘stop the boats’, for example – which seeks to reduce any potential noise in favour of a clear, unambiguous meaning, any ‘message’ in a poem is complex and ambiguous because it makes us conscious of the form and movement of language itself. Although poetry is often – perhaps always – political, as a vehicle for political ‘messages’ it is a very leaky vessel. Clark gets around this by saying the medium is the message, a la Marshall McLuhan – but it’s clear throughout the book that he is speaking about communication in its most instrumental sense, as a means of public persuasion. This doesn’t affect Clark’s central contention, that a better knowledge of how poetic language is employed in political speech would make us all better political critics. But it does affect what kind of poetry he discusses, and indeed, what kind of political speech. Perhaps what bothers me most about Stay on Message is how little reference there is to the subversive qualities that have always existed in poetic language. This is because Clark discusses poetry almost entirely in terms of its conventions. Perhaps this is most problematic in his discussions about truth and truthfulness, which he says are best judged with a ‘clear sense that we can listen to a political utterance within its context, as a product of the poetic traditions and circumstantial factors that have brought these remarks together at this time and in this place’. Clark’s focus on oral poetry means that he mainly refers to classical or conventional poems, as his discussion particularly rests on the formulaic aspects of poetic language. Referring to the use of poetry on ceremonial occasions – Lawrence Binyon’s ‘Ode of Remembrance’ in ANZAC ceremonies, for instance, or the US tradition of a poet reading at a presidential inauguration – he notes how poetry invokes ritual and tradition, generating a heightened sense of occasion. He describes poetry as a creator of ‘norms’: a prosodic template that outlines what is and is not appropriate to say in particular situations. But as well as outlining norms, poetry violates them, seeking to say what is not possible to be said. Clark considers this in its negative aspect, as when he discusses malapropisms such as Rudd’s ‘rock’n’roll with the punches’. Language in such moments is, he says, the means by which a potential volatility is stabilised. That is, Clark sees such slippages as occasions when language revealingly re-establishes its norms, rather than as eruptions of potential excess. He defines poetic craft primarily as a means of controlling or eliminating unwanted excesses of meaning, and poetic innovation as merely a way of creating new norms: ‘Done effectively, such innovation changes the norms for future speakers.’ This is fine as far as it goes. But it misses something much more powerful (and far more poetically significant): the evanescent moment in which a norm is broken. I’d suggest that it’s precisely when language fractures that we might, as audiences or citizens, glimpse a moment of truthfulness. Writing about the poet Stesichorus (650BC), for instance, Anne Carson points out that in Homeric epithets ‘being is stable and particularity is set fast in tradition’. Stesichorus ‘released being’ by unlatching the adjective from the noun, breaking the stereotype, and ‘all the substances in the world went floating up. Suddenly there was nothing to interfere with horses being hollow-hooved. Or a river being root silver’. This fluidity of being is at least as important to poetry as the recognisable formula: it is the moment when a cliché is opened up and inverted, when it is suddenly fresh and estranged, a moment when meaning does suddenly make itself before our eyes. It’s notable that Clark ignores a fruitful model of poetry-in-action, the theatre. Clark’s analysis of the relationship between speechwriters and the politicians who deliver the speeches would be greatly enriched by a better understanding of performance. He speaks of politicians as ‘actors’, and discusses how performance might enhance or detract from the reception of a written text, without ever considering the poetics of theatre, drama or performance. There is a rich and various literature, from Bertolt Brecht on gestic language to Hans-Thies Lehmann on the shifting place of the contemporary spectator to the speech-act theory of Judith Butler, which remains wholly unexplored in this book. Theatre is the artistic arena par excellence where the tensions between oral and written speech are enacted. And it is also a place where slippages – between intention and performance, language and act, perception and the real – are continually exposed. Perhaps most importantly, theatre raises an idea only hinted at in Stay on Message: the notion of ‘roles’, the parts people play when they employ public language. Roles speak to the contradictory ideas of truthtelling and truthfulness that different publics negotiate. What does it mean, for instance, when an actor’s performance is praised as ‘truthful’? Is the media search for the ‘real Julia’ or the ‘real Tony’ a question of poetic prosody, or is it more properly about performance? This is, as he says, why Obama’s oratory is exciting. But although he claims that a consciousness of poetic devices allows an audience to make moral judgments, and more germanely, judgments about truthfulness, how this happens is ultimately unclear to me. That audiences do make moral judgments is beyond question; whether these judgments have anything to do with truth is another question. Clark defines truthfulness as a question of public honesty: ‘an awareness of the poetic dimension greatly enables us as critics to appraise whether a given utterance upholds standards of honesty’. That is, if we were more aware of the poetic power of political speech, both in its capacity to bore and confuse us or exhilarate and mislead us, it would be less easy to lie. Yet the series of questions Clark asks to establish public honesty – ‘does [an utterance] bear out an acknowledgement that its publics are entitled to the important facts, shared in good faith?’ and so on – have nothing to do with poetry at all. He is right in that understanding techniques of style and performance can be useful in evaluating public speech, but in the absence of (for example) being able to check stated facts against other sources of information, how useful is it? Political history is full of very beautiful lies. Perhaps, although I am not sure about this, Clark is arguing for a poetic equivalent of Brecht’s Verfremdungseffekt, the theatrical technique which seeks to make its audience aware of how the work it is witnessing is made, and therefore more critical – of themselves as audience members, of the work they are watching and, crucially, of the society in which the theatre, the audience and the artists exist. Or perhaps he is simply exhorting politicians to become better rhetoricians by becoming more aware of poetic technique. That would certainly make public utterance in Australia less banal, but I doubt it would make it more honest. It may, in fact, have the opposite effect: persuasiveness is not, after all, a synonym for truthfulness. He leaves the question of truth in language in a position of subjection. ‘Truthfulness,’ as the quote on the cover says, ‘is always subject to checks for aesthetic compliance.’ I’m not at all certain that poetry makes a good policeman. More profoundly, is it possible for language to be truthful? That is a poet’s question, not a politician’s. It’s also a revolutionary question. And it’s the question signally missing from this book. of voices spread across the Greek World, both in time and space. true in the example that the weapons were made of bronze, while also having the incorrect and the false side by side, for example Bronze Age Mycenaens did not cremate their dead. all this higgedly-piggedly confusion of words there is much that strikes the reader as true. Joyce commented that Shakespeare is the happy hunting ground of minds that have lost their balance, this is even more true of Homer. Abandon all hope, ye who enter. objective uncertainty passionately held in an inward appropriation process. Maybe we should even have a one year moratorium on using the word truth. Give us the space and time to come up with new ways to describe the intricate relationship between the external and the internal. Again thanks for the interesting and thought provoking review. We differ slightly by our interpretation of what Joyce meant. I think it was more an observation of the endless possibilities within Shakespeare for validating personal predilections rather than being an country of feral truths. Even so, I’d hardly put Homer in the same category. Shakespeare is ambiguous and equivocal about most everything; Homer is rarely either. And I’m not too sure how often I’d run to Kierkegaard for advice, either. Great on analysis but occasionally a little ropey on conclusions. HA! way to smash my illusions! While I agree in general with your view of SK, I think that in this case he was correct. Nature loves to hide, our senses lie to us, our memories are in constant flux and in company with sense perception love to lie to us. Much of modern science, while expanding our knowledge also shows us that the world is not what we think it is. have a lot of fun…. Some of this may be what Les Murray is getting at when he talks about feral poetry and quotes political catchphrases. We are more ready to recognise political speeches as poetry than we are to recognise spoken word as literature. Thanks for the comments. Yes, it all depends what you mean by truth. It’s an old argument – Plato wanted to ban poets from his Republic (and especially children), because their work relied on emotion and therefore corrupted rational thought. Basically, poets were liars: they created a corrupt representation of reality. (Aristotle countered that with his idea of catharsis). I guess you could argue that a lot of politicians do exactly what Plato accused poets of, mostly without creating any poetic pleasure. A very, very interesting review/essay Alison. Your concluding remarks in the review — “is it possible for language to be truthful? That is a poet’s question, not a politician’s” — are spot on, and I feel Badiou (whose work in aesthetics is precisely around the question of there being a connection between art and truth) would agree with that. I’m perplexed by the Lachenmann quotes, though: the first one I totally agree with (although I personally wouldn’t see beauty synonymous with truth, but i understand the keatsian impulse here) and i really, really like the idea of poetry/art “dialectically mastering” “the contradictions which mould the consciousness of our society”; but i find the second quoted paragraph above puzzling, especially towards the end where he says the truth (of a particular work of art) is “in the experience … of people who succeeded in expressing themselves”. Would such an experience necessarily be one to do with the social contradictions and dialectics mentioned earlier? I’m not too sure. What if the experiencer/artist is simply deluded, controlled by ruling class ideology, etc? Could we always trust – believe in the truthfulness – of an artist’s experience, no matter how skilfully it’s expressed? I guess it is ultimately the Romantic notions (of genius, imagination, beauty, etc) that i’m taking issue with here. I think Lachenmann is spot on when he dismisses “the cheap pretensions of avant-garde hedonists, sonority-chefs, exotic-meditationists and nostalgia-merchants”, but i don’t think ‘beauty’ — if one must — can be rescued from these via a Romantic transcendentalism. I prefer his idea, at the end of the first quoted para, of artists “coming to grips” with the world’s antagonisms. Anyhow, much food for thought. Thanks again for an excellent article. Hi Ali – Thanks! – and thanks for your question. I fear this will be another long answer… I think you’re seriously misreading Lachenmann here: the whole of the sentence matters (in fact, both paragraphs matter). “And yet such belief, even in its most illusion-free variants – such as in Beckett’s art – is not contained in a philosophical or intellectually encoded message, but in the experience, communicated by sensory perception, of people who succeed in expressing themselves … knowing full well that the artist has not something to say, but something to create.” He’s talking about making, as opposed to “saying” something, in much the same way Eagleton is when he speaks of poetry: it’s clearly a reaction to the kind of barbarism which reduces art to a statement, and it’s (crucially) an insistence that art is material, created and received in a material world. (In relation to his insistence on sensory perception, it’s probably worth remembering he’s a composer). Thinking about this question this morning, I also wondered about physicists when they speak of an “elegant” solution or theory. Something in that too, maybe. Thanks again, Alison. I can see that I was misreading the second part of the quote — it’s been a long week — hence my confusion. Thanks for clarifying things. And I think the fact he’s a composer does make some additional difference. PS: Sorry Maxine, didn’t see you there. I think Tom Clark is in part making the case for performance poetry to be considered literature: he certainly calls politicians et al the premier performance poets of our time. But that exclusion from “literature” occurs to many forms of writing (genre writing is another example). And, as this argument shows, it is extremely vexed around another form of writing for performance, plays themselves. Enjoyed the article very much, thank you. I’m not sure why I am doing this because my first response to Tom Clark’s assertion is ‘So what?’. Let’s assume that his contention is true in every respect: I am still left with the question ‘What changes?’ And for the life of me, I can’t think of what would or could. It seems like an idea nicely boxed with an argument but when one opens the box one finds that the point is not included. 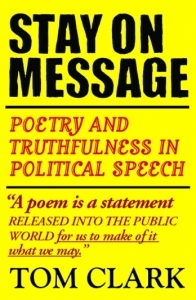 Even if I did buy the argument that understanding the poetry in political messages allows us to judge better the truths therein, the flip side – how does that impact how we then see the essential nature of poetry – creates a bigger lie. What does make it worth while, though, is the range of issues that arise out of it. Here, alas, is where I have a minor disagreement with your comments: to wit, the relevance to Shelley. In Defence of Poetry refutes Clark’s contention in many ways, not the least of which is Shelley’s distinction between prose and poetry; a distinction which is not purely a matter of mechanics, elements and structure. Now, I’m not saying Shelley has to be right. When I was 16, I probably did think that anything he said had to be right but I’m a little more jaded one or two years on. It’s the fact that Clark can only make the claims he does because we let the mechanics of logic remove the boundaries definition are supposed to create. It’s the same process by which ‘theatre’ has become such an all-embracing term as to mean almost nothing. Which is also the problem with the Eagleton quote gracing the cover. I can’t argue with it; logic and semantics would make me lose if I did. It is not untrue but it is nowhere near the truth. Given that, I am sure that every politician thinks they spout nothing but poetry. We know they don’t – and that’s not a cynical observation. They can use all the devices they wish, pepper them with artifice and poetic craft and they still won’t. Imagination may be the alchemy of reason but poetry isn’t the alchemy of political language. All the mechanical bits, no matter how completely and meticulously assembled, don’t make the product. Without the poet, the possessor of the imagination, before you can say Disraeli, you’ve mis-stepped into a pile of doggerel. It’s a cheat to say that language is always truthful, provided one can decipher the lies in it, though there is some truth in it. It isn’t merely definition that gives language both meaning and truth. It’s how it plays on us beyond that. That’s what poets do. And much appreciated. Regardless of how and why your views and Clark’s overlap and depart, you have excited me with your references. I will remember the truth of this observation especially: “Poems do not – in fact, cannot – ‘stay on message’. (Well, perhaps bad poems do: and it might be a measure of their badness).” Just so. Many thanks, Mr Carter. Hi Alan – just a couple of points: the quote on the cover isn’t Eagleton: it’s Clark. (Oddly, I notice on the graphic on this page, there’s a different quote to the one on the front of mine). And as I said, the major difference between Clark and Shelley is that “Shelley considers poetry to be thought-in-action, whereas Clark discusses it as a phenomenon of more-or-less legible linguistic behaviour intended to manipulate others.” That, to me, is a major difference, and is pretty much my argument with the whole book. And was anyone contending that language is always truthful? It’s a bit chastening to have all one’s shortcomings dealt with so succinctly! 1. I must do better research. The only location I could find for the quote was in Eagleton’s How to Read a Poem, so I just assumed it was his. 2. I thought you were very clear about your issue with Clark, and it’s a perspective I wholeheartedly share. Sorry if I wasn’t clear enough in turn. 3. ‘It’s a cheat to say that language is always truthful, provided one can decipher the lies in it, though there is some truth in it.’ was not aimed at anything you said but a reference to another comment. I should have been less clumsy. Hi Alan – hope I didn’t sound too brusque, I didn’t mean to. Though your post gave me a sudden fear that maybe it is Eagleton, and that I had made a terrible mistake… No, found it.(Phew). Sorry on my part if I was unclear. By the way, I hope you all do read the book. I found it enormously stimulating.